Airvolution project manager Micheal O Broin is spearheading the Berry Burn extension plans. Developers planning an extension to one of Moray’s largest wind farms insist they are powerless to control separate plans for the same site. Airvolution and Statkraft are proposing 10 new turbines, each up to 490ft tall, as part of an extension of the Berry Burn development, about eight miles south of Forres. 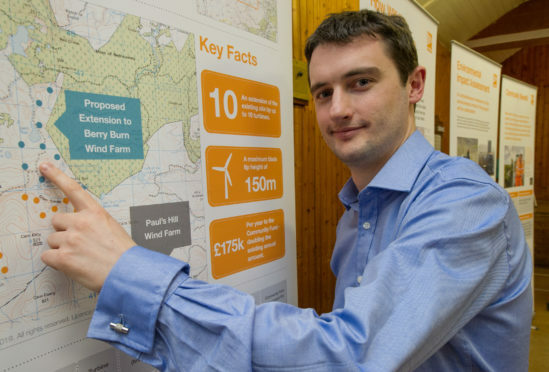 However, separate proposals that could lead to 47 turbines up to 575ft tall almost encircling the current site have already been put forward by Force 9 Energy as part of its Clash Gour development. Yesterday, Airvolution’s project team stressed they had no control over plans from a separate company during the first of a series of public exhibitions about their proposals. Instead, the team explained they believe the rural nature of the Berry Burn site, as well as shelter from surrounding forestry and hills, means the area has extra capacity for more turbines. Project manager Mícheál Ó Broin said: “The main reason for expanding it is that it is very remote. “It is going to be more than three kilometres (1.8 miles) from the nearest house to any of the extension turbines. Berry Burn already has 29 operational turbines, each up to 325ft tall, on the site. Due to the 10 new towers being considered an extension to the current ones, the latest plans will be submitted directly to the Scottish Government. If approved, the development will generate enough electricity for 27,000 homes and double the current community fund, raising an extra £175,000 per year. Fears have, however, been raised by locals that the area could be “saturated” by turbines if both the new Berry Burn plans and Clash Gour proposals are both approved. Airvolution expects final plans to be submitted by early next year, while expecting the new turbines to become operational in 2023, if approved. Further public exhibitions about the Berry Burn extension are due to take place today at Rafford Village Hall, between 10am and 2pm, and at Margach Hall in Knockando between 4pm and 8pm, before a third exhibition takes place on Saturday at Forres House from 10am to 2pm.